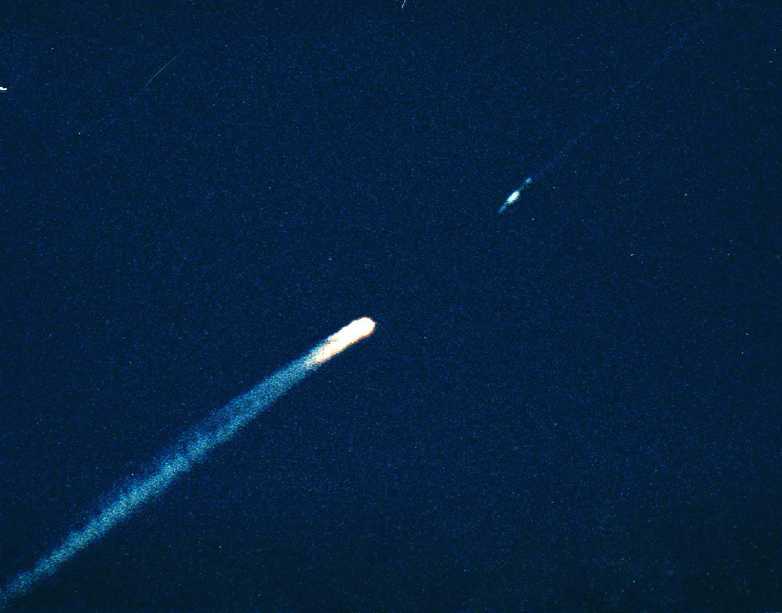 Missile firing on SCP-3320 in active phase (left). Special Containment Procedures: SCP-3320 is contained within Zone-3320 in the southern Atlantic Ocean. Zone-3320 consists of Site-3320 on Bouvet Island, leased to the Foundation in perpetuity by the Norwegian government, and a 50km exclusion zone in the surrounding ocean. SCP-3320 should be positioned at a point between 15 and 30km from Site-3320, with no vessels or aircraft to come within 2 5 10km of SCP-3320 except when required to implement containment procedures. Site-3320 serves as a base for a MIM-104D Patriot surface-to-air missile battery (consisting of 4 launchers), the Type 45 anti-aircraft destroyer SCPS Ancile, and associated logistical vessels. When SCP-3320 enters an active phase, all available weapons are to fire upon it until it is disabled. SCP-3320 is then to be returned from its landing position under tow to Zone-3320. Given the amount of energy released by SCP-3320 activations, a disinformation program is in constant operation to conceal them under the guise of volcanic eruptions, earthquakes or military exercises. As of 27/09/2017, directional radio jamming equipment has been installed at Site-3320, and all transmissions emanating from SCP-3320 should be blocked. Description: SCP-3320 is a cylindrical construct of extraterrestrial origin 155m in length and 30m in diameter. It is composed of an unknown grey metallic substance surrounded by a transparent outer shell of a material resembling layered carbon nanotubes when under microscopic examination. This shell has a semifluid composition and possesses an internal self-repair mechanism between the layers, conferring SCP-3320 with significant resistance to damage and hindering detailed investigation of its internal structure. This mechanism is also able to rearrange the structure of the outer shell such that SCP-3320 maintains buoyancy in water. A two-part propulsion mechanism is located at the rear end of SCP-3320. The visible section is a fusion rocket system (fuelled by seawater-derived hydrogen) which allows SCP-3320 to escape the atmosphere. The second part of the mechanism has not been viewed directly but imaging techniques suggest it relies on the production and energy release of exotic matter, beyond currently available technology. Based on comparison of this mechanism to available Project Heimdall data, this would allow SCP-3320 to theoretically reach speeds of 0.95c in interstellar travel. A collision with SCP-3320 at this speed would result in a release of over 1 YJ of energy1. The forward surface of SCP-3320 bears a number of engravings. One central engraving is uniform and regular, and has been identified as a pictorial representation of the star Kepler-174 in the Lyra system, with the exoplanet Kepler-174d (SCP-3320-1) its focus. Multiple engravings of crude quality surround this image, including other solar systems (13 unique systems have been confirmed at this time) accompanied by depictions of an octopodal organism with a cylindrical body and a variable number of other appendages. These depictions are accompanied by an unknown pictographic language; portions deciphered by Foundation linguists are believed to represent feelings of disgust and hostility. At intervals of between 1 week and 2 months, SCP-3320 enters an active phase where it will angle itself to an elevated position and initiate a launching sequence. The release of energy in this process has increased over time from 0.2kt to 0.8kt, with blast effects extending up to 9km. While the outer structure of SCP-3320 has proven resistant to damage from conventional weaponry, forces applied from explosive detonations are able to divert SCP-3320 from its trajectory, which results in its deactivation and fall to sea level. It is likely the increasing power involved in launching sequences is a response to these procedures, which poses difficulties for long-term containment. Analysis of SCP-3320's trajectory when active has confirmed SCP-3320-1 is its ultimate destination, barring unforeseen deviations. The purpose of SCP-3320 cannot be conclusively determined, but given its absence of transportation or scientific functionality, it is almost certainly intended to be [DATA EXPUNGED]. Project DRAKE, running from 2014 to 2017, was an interdepartmental effort for astronomical investigation of the Lyra system, with a focus on Kepler-174 and Kepler-174d (SCP-3320-1). Secondary aspects of the project encompassed investigation of other astronomical bodies potentially related to SCP-3320. [DATA EXPUNGED]. There was no evidence of capacity for interstellar travel, and it is unlikely that SCP-3320 had any prior connection with this location beyond the markings present on its surface. Investigation of 11 solar systems and 17 extrasolar planets based on markings found on SCP-3320 was also carried out. These planets shared the characteristics of being terrestrial and in theoretical habitable zones of their respective stars. No evidence of any life, intelligent or otherwise, was found. All planets had experienced a catastrophic impact event, consistent with [DATA EXPUNGED] a large number of asteroids. Based on evidence gathered regarding SCP-3320's destination and purpose, it is likely that allowing SCP-3320 to complete a launch sequence would remove it from any meaningful association with the Earth and result in its effective neutralisation. Given the significant expenditure of resources required in the containment of SCP-3320, its threat to normalcy, and hazardous nature to personnel involved, SCP-3320 is a suitable neutralisation candidate, and I advise that current containment procedures be ceased forthwith to this effect. The Committee considers this proposal to be inconsistent with the Foundation's mission of ensuring stable containment of anomalous objects. Containment procedures of SCP-3320 have been satisfactory until this time and the hazards posed by SCP-3320 are judged by this Committee to not reach the threshold for neutralisation. Additionally, it was also considered by the Committee that allowing SCP-3320 to breach containment, travel through the atmosphere and enter local space would present a significant risk to secrecy at each stage of this process. For the full text of this decision, please submit an application in writing to the Committee office. We believe it is time to reconsider neutralising this object. In addition to the continued relevance of the reasons outlined in Proposal 3320-1, the importance of this path has become apparent given the ongoing escalation in the severity of SCP-3320 launch events, which have resulted in 11 personnel casualties in 2017 so far. As the previous Committee decision cited secrecy concerns as a factor in the decline of the proposal, we have also been able to secure funding and support from the Department of External Affairs with a suitable cover for the launch of SCP-3320 as a private space venture, which should be sufficient to ameliorate these concerns. Although the ongoing escalation in SCP-3320 launch events is a point of concern, the Committee considers this a matter to be resolved by assigned research staff and of limited relevance to ethical decision-making. The opinion of Decision 3320.1 is still broadly applicable in this situation, and sufficient grounds for neutralisation justifying the subversion of core Foundation mission principles has not yet been demonstrated. This directive has been issued granting authority to Site Director Zhang and all relevant subordinates to proceed with previous proposals for the neutralisation of SCP-3320. Notwithstanding the opinions of the Ethics Committee, this office considers the case for its neutralisation as outlined in these proposals to be strong. However, the need for urgent action in this regard has become apparent with newly available data on radio transmissions emanating from SCP-3320; given the likely function of SCP-3320 and intentions and capabilities of its creators, any communication from SCP-3320 would pose a severe risk to the security of the human race. Procedures put in place to mitigate this situation will only serve as a stop-gap measure, given the potential broadcasting power available to SCP-3320. In addition, the Department of External Affairs has issued a briefing in support of SCP-3320's neutralisation in the interests of maintaining stable relations with the Global Occult Coalition. Concealment of SCP-3320 from the GOC has been unsuccessful and the Undersecretary-General has expressed serious concerns about our management of SCP-3320. The GOC has indicated a willingness to assist with their own resources (terrestrial and extra-terrestrial) in the neutralisation process if necessary. Allowing the launch of SCP-3320 and its egress from our solar system will serve as an immediate, effective and minimal-risk method of resolving these problems permanently. The Committee is issuing an immediate veto of Directive 3320.001 under the authority granted to the Committee by Article 3 of the Charter on Council and Ethics Committee Powers 2009. The Foundation's mission is to secure, contain and protect, with 'destroy' being antithetical to these principles. No convincing evidence that SCP-3320 is uncontainable to such a degree that neutralisation is required has yet been presented at any level. At a minimum, full analysis of the predicted future efficacy of radio transmission jamming should be carried out prior to making an unfounded claim that this would only be a 'stop-gap'. The position of the Global Occult Coalition is of no relevance to the Foundation's ethical operation, and to use maintaining relations with the GOC or any other external organisation as evidence for containment decision-making sets a dangerous precedent. It has also recently come to the attention of the Committee that a significant amount of information in the SCP-3320 file has been expunged, ostensibly for security reasons. Whilst we have reservations about this removal, of greater concern is the fact that the data is not only missing but has been selectively deleted in such a way as to give a misleading impression to the viewer. In the context of the repeated requests for neutralisation of SCP-3320 contrary to the advice of the Committee, we must condemn this decision in the strongest terms. The Council expresses its disappointment with the position taken by the Ethics Committee in Decision 3320-3. The Committee has overstepped its bounds relating to SCP-3320 on a number of occasions, with the most recent decision being the most egregious example. The Committee is primarily called upon to evaluate decisions proposed or carried out by research staff, and the issue of unsolicited recommendations for containment procedures is not within its mission parameters. The question of relations with the Global Occult Coalition or any other external group is also an overreach of the responsibilities of the Committee, as are demands to alter information security procedures, which remain a RAISA matter. The request for the reclassification of SCP-3320-1 is denied, as is the request to restore expunged data. Given the questions this raises about the soundness of the current composition of the Committee and its leadership by Dr Singer, the Council is currently deciding on an appropriate response. + Document locked by user: das02. Enter access code. Obviously, I shouldn't be sending you this. It would be grounds for removal from the Council, and possibly worse. I don't think that would happen, though. The others know that it's best to resolve this quietly before things get uglier. You know that this principled stand is pointless. The Council's patience with SCP-3320 has long since run out, and they're going to move against you. I'm sure you would relish the chance to be fired in a blaze of glory, but I doubt you bargained on the firing squad being a literal one. Some of the others say this goes beyond a difference of principles and into the realm of treason, and frankly, I can see where they're coming from. We all swore the same oath to protect the world; which world was implied. Nobody expected it needed to be spelled out to you. I understand that you grew fond of 163 in your previous position, but remember what you are and where you came from. This situation is bad for the Council, bad for the Foundation, bad for you, and bad for your family. You're not serving the greater good of anyone by dying on this hill. We didn't create this thing, we didn't launch it, and we aren't responsible for where it ends up. I can guarantee that if you issue a retraction the whole business will be forgotten. We'll make sure billions of people can sleep easy without having this hanging over their heads, give the Foundation a lot of extra resources to dedicate to good causes and you can even keep your job. If you won't listen to me as an Overseer, please listen to me as an old friend. You need to let this go, David. 1. Approximately 500,000 times the total energy released in historical nuclear testing.